Free Comic Book Day 2099. 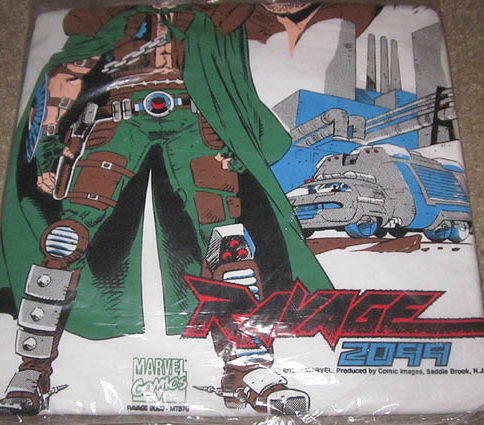 Yes, that’s right, I had a customer sporting a Ravage 2099 shirt. And no, it wasn’t an old, ratty shirt he’s been wearing since the early ’90s. He’d picked it up off the eBay still sealed in its original package, much like the auction I’ve linked to. 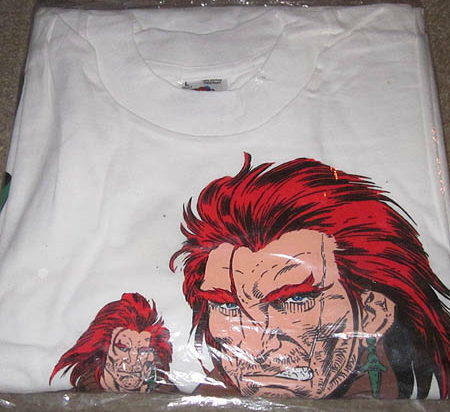 Okay, the exact value of “coolest” may vary depending on your opinion of Stan Lee’s finest creation, but this was the last thing I expected to see a customer wearing, particularly in this Year of our Lord, Two Thousand Twelve. It gave me a good, surprised laugh, and thus, my most sincere kudos to that customer of mine. This post involves 20-year-old spoilers for Grimjack. § September 28th, 2009 § Filed under grimjack Comments Off on This post involves 20-year-old spoilers for Grimjack. Now I realize for those of you not in the know, not a lot of that is going to make a whole bunch of sense to you, but for those of us fully aboard the Grimjack train (…er, what?) this was all stuff we Had to Read. And I know that I was really looking forward to the next incarnation (or rather, incarnations, as twins) of the character (especially with my interest piqued by interviews in Amazing Heroes and such)…and nearly twenty years on, after the Grimjack reread, my interest is piqued again. Ostrander himself addressed the issue in a message board posting from last year…basically, he’d like to continue from where he left off, but isn’t sure when that’d happen. Like I discussed before, trying to pick up where Grimjack left off would have likely been a disaster, and going “back to basics” to capture new readers is a better marketing strategy than providing “forward motion” (for the lack of a better term) for however many original Grimjack fans may yet still be buying comics a couple of decades later. Of course, I’m enjoying the recent Grimjack series from IDW, which provide “untold origins” of various aspects of the GJ universe, as drawn by cocreator and original GJ artist Tim Truman. The language is a little rougher, which surprised me a bit (since First Comics didn’t allow the Seven Words You Can’t Say on TV in their comics), but it’s fitting and not overdone. And Ostrander’s writing, and Truman’s art, have never been better. I’m hoping sales and interest in the character are strong enough to get us to the point where we can pick up from the end of the original First Comics series, but I realize, in the current marketplace, it’s a real uphill battle. But it’s a good series with talented creators, and I certainly wish it well. Plus, I’m selling the books at our shop, so I’m trying to do my part! Related: please consider contributing to Comix 4 Sight, a charity to help Mr. Ostrander cover the medical costs associated with his glaucoma surgeries.